Today I'm talking about one of my favorite stores - COSTCO! The back of my van loaded up from our last Costco run! 1. Costco does a lot of research - if they're selling it, the product is of good quality, if not the best quality. 2. Costco is a warehouse store, so you buy in bulk and save because of it. Items are VERY affordable at Costco - for example, I drink La Croix and it is $4 at the grocery store for 8 cans. At Costco, I can get 24 cans for $7 and not pay deposit since I'm buying it in Washington. 3. Costco has big carts that fit two kids + a car seat and you still have room for a few groceries. Chandler lately hasn't been wanting to sit in the front of the cart, so I put Cal in his car seat inside the basket, and Chandler sits next to him. I push the cart that has them in it, and then pull a second cart behind me to hold my items. We just make a train, Chandler is good about sitting down, and we just make it work. Samples help keep Chandler occupied, along with watching a few videos on my phone if we have to resort to that. Usually though, he likes to look around and if we're not too tired we can get thru the entire shopping trip without a meltdown. 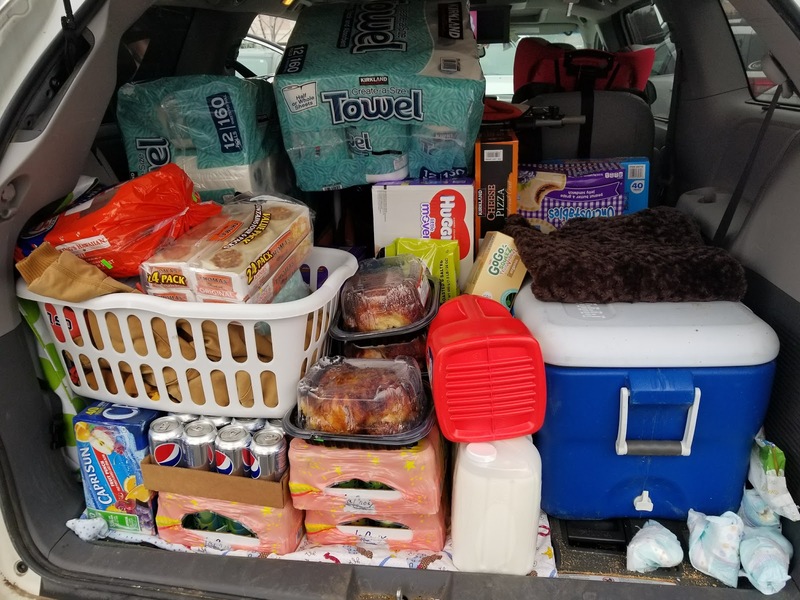 There are a few things I will only buy at Costco....and if that means I need to make a trip to our nearest Costco, which is 45 minutes away - well, I make it happen. Toilet paper, paper towels, diapers, wipes, formula, La Croix, light bulbs, snack items (shelled pistachios, smoked almonds, string cheese, Tillamook cheese), frozen cheese pizza, gogurt and pancake mix are all items I buy exclusively at Costco. On the trip we made this weekend, I also picked up items for our office Christmas party ($5 rotisserie chickens (we think of them as mini turkeys ;)), bagged salads (Mediterranean & Strawberry Vinaigrette), rolls and turtle cheesecake. For ourselves, the cooler is filled with veggies (broccoli, snap peas, baby carrots, celery sticks and salads), mac & cheese, La Croix, Diet Pepsi, almonds, pistachios, diapers, paper towels x 2 (we're breeding fall cows! ), a few Christmas presents (pjs & books), batteries, English muffins, precooked bacon, milk, Capri Sun's for Chandler's Christmas party at daycare, squeezy fruits for Cal at his daycare, easy lunch stuff and laundry soap. Not pictured are the string lights I have in the front seat to light up our carport. And a pile of dirty diapers from diaper changes that day on the right - I didn't purchase those. 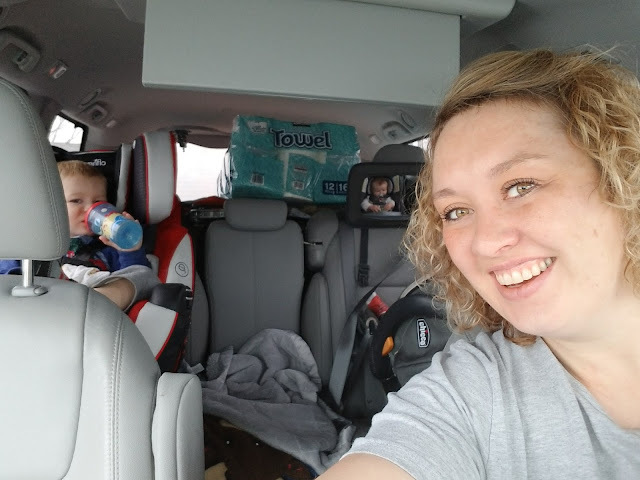 ;) That's why there's a blanket on the cooler - it stays in the van 24.7 and when it's not being used to haul groceries, it makes an excellent changing table that I don't have to bend down to use. The boys were good shoppers! We're buckled in, and ready to hit up Sonic for a drink. I always treat myself to a 44 oz Diet Cherry Limeade after a Costco run. :) Chandler got a corn dog for lunch, and we headed home. 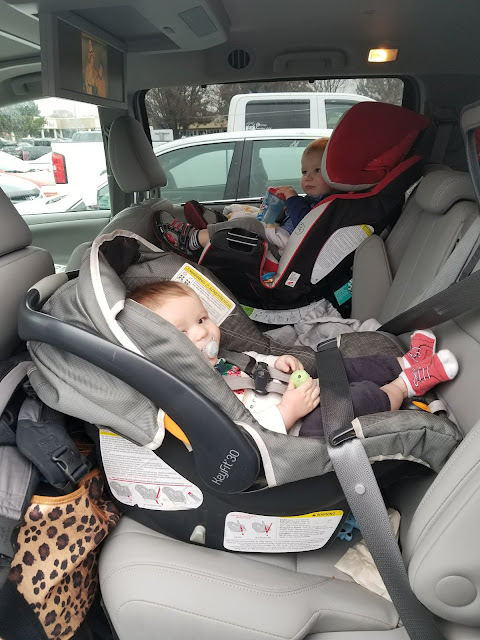 Shopping at Costco with the boys is a bit of a strategic effort - but it's worth it to get all of/most of my groceries for the month in one trip! Packed up & ready to head home! I also always buy clothing online - there will be more sizes & colors than in the store, and you don't have to search thru stacks to find your size. 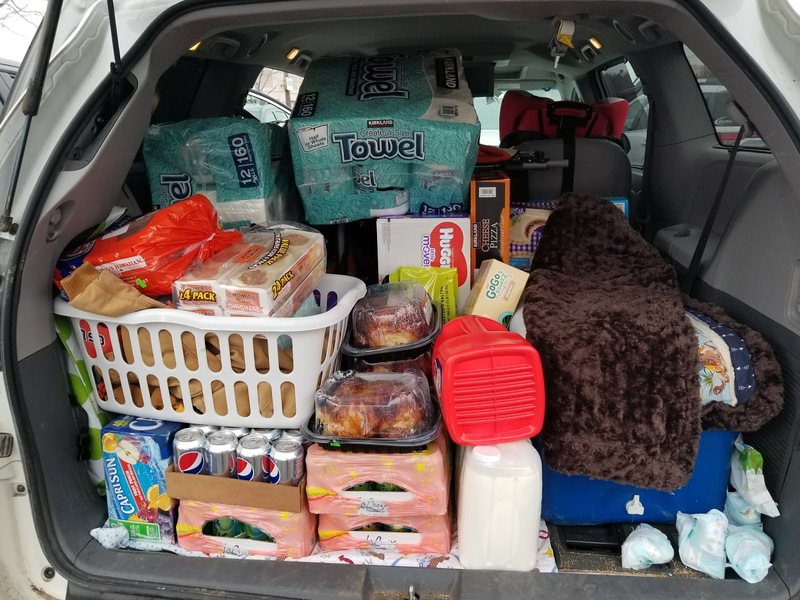 So that's a look at a real life Costco shopping trip. Hi! Thanks for posting about Costco! I loved shopping there when I lived in Memphis, TN. I don't have one near me now, but I was unaware we could shop online! Do you have to be a member to shop online?! Thanks again! I'm new to your blog. I'm a mother of 4 and we have a small hobby farm.